Australian Open champion Novak Djokivic retains top spot in the latest ATP rankings. Meanwhile, Rafael Nadal has slipped out of the world's top four for the first time in more than seven years. 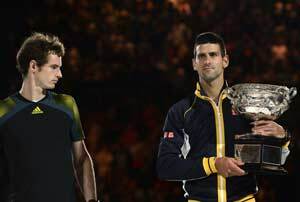 Australian Open champion Novak Djokovic retained his place as men's world number one in the ATP rankings released on Monday. The Serb, who became the first player in the professional era to win three straight Australian Open titles with his defeat of Andy Murray on Sunday, stays on 12,920 points. Australian Open semi-finalist Roger Federer remains stagnant at second. Finalist Andy Murray remains third, despite beating Federer at the Australian Open. Spaniard Rafael Nadal has slipped out of the world's top four for the first time in more than seven years. Nadal drops to fifth, with his compatriot David Ferrer moving up a place to fourth. Nadal has been out of action with a knee injury since June and is due to return to action next week in Chile. ATP top 10 as of January 28: 1. (1) Novak Djokovic, Serbia, 12,920 points 2. (2) Roger Federer, Switzerland, 10,265 3. (3) Andy Murray, Britain, 8,480 4. (4) David Ferrer, Spain, 6,865 5. (5) Rafael Nadal, Spain, 5,400 (6) Tomas Berdych, Czech Republic, 4,680 7. (7) Juan Martin del Potro, Argentina, 4,210 8. (8) Jo-Wilfried Tsonga, France, 3,355 9. (9) Janko Tipsarevic, Serbia, 3,180 10. (10) Richard Gasquet, France, 2,720.